Making it legal for children to work in family enterprises after school indicates that the children of the poor are not worth the effort. Thirteen-year-old Vishal has been in Delhi for two years. His parents sent him to a maternal uncle’s home in the expectation that a big city school would give their oldest child a better education. He is enrolled at a Municipal Corporation of Delhi school. Several afternoons a week, and every weekend, Vishal can be found at his uncle’s vegetable stall near one of south Delhi’s government staff colonies. His quick mental calculations impress most customers. A few chide his uncle for making Vishal work instead of going home after school to do what other children do – rest, play, do homework. 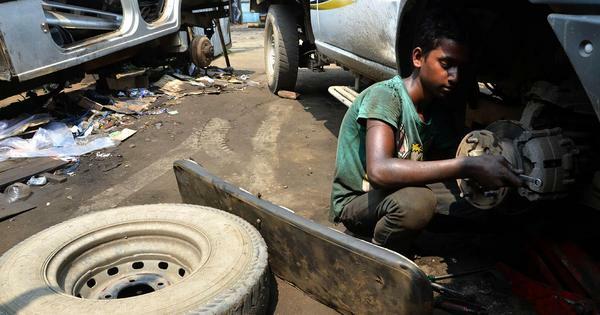 Under the amended child labour law, passed by the Rajya Sabha on Tuesday, what Vishal is made to do is entirely legal. Helping in the family home or enterprises after school hours is now protected by law. Labour Minister Bandaru Dattatreya said India was unique and the law should reflect economic reality. He cited his own example of having helped his single mother with housework and working at her onion stall during vacations. Prime Minister Narendra Modi too has spoken countless times about helping his uncle with his railway station tea stall. They are undoubtedly stellar examples of how far talent and determination can take you. But, in the years Modi and Dattatreya were in school, the majority of Indian children were not enrolled in school, and many were in full-time work. So, however difficult their personal circumstances, they were better placed than the majority of their compatriots who had no opportunity to go to school. Today, because of the Right to Education Act, 2009, which mandates the right to free and compulsory education for all children aged six to 14, most children are enrolled in school. But, being enrolled in school is not an advantage in of itself. Minister Dattatreya told Parliament that the amended law was made keeping in mind the Right To Education Act. Given that the provisions permitting work in homes and family enterprises stipulates this has to be “after school hours”, it might seem there is no conflict. However, had the government asked those tasked with children’s education if the legal protection for after-school work was in the spirit of the Right To Education Act, it would have heard a resounding NO. There is enough documented evidence that shows a direct correlation between learning levels, school completion rates and family income, circumstances and caste. With few exceptions, children of the poorest are more likely to attend school irregularly and hence struggle with learning and drop out early. In short, the poorest receive the poorest education. Teachers cite the lack of family support or interest in education as the biggest difference between children who persist with formal learning and those who do not. Just days before the Rajya Sabha passed the amended Child Labour Bill, at a meeting of mostly rural primary school teachers in Bhiwani, Haryana, teacher after teacher spoke of children of poor parents who “send them out to graze the cattle as soon as they go home” or “take them along to help them with their jobs” or “come late or not at all during the harvest”. These were the children, they said, who learnt the slowest and found it hardest to gain or retain rudimentary reading, writing or arithmetic skills. In big city government primary schools too, teachers find that their most troubled children, the most irregular and inattentive in school, come from homes where economic circumstances find them cooking or cleaning or minding younger siblings or going out to help in the “family enterprise” – for example vending or “helping their mothers” clean other people’s homes. Primary school teachers in Delhi report that girls as young as eight or 10 “help their mothers” in such work. As it is the government school system, where the poorest children are enrolled, has little empathy with their circumstances. Children of the working poor are, in the main, seen as no-hopers who will go the way of their parents and are not worth the effort. What the amended child labour law does is confirm their prejudice. It is, as Dattatreya told Parliament, India’s unique social and economic condition. In supporting the amendment the government (and the mostly absent Opposition) has signaled it wants to keep this uniqueness intact. In bare bone terms it amounts to the State abandoning its most vulnerable children and not giving them a shot at a basic education.